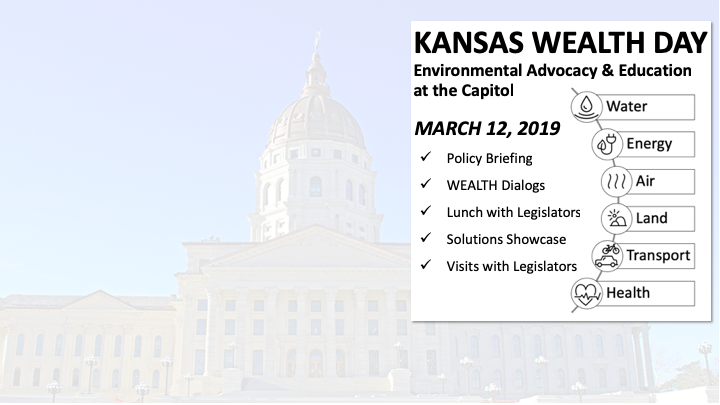 Join Kansans to learn about and advocate for Water, Energy, Air, Land, Transportation, and Health. Legislative visits scheduled throughout the day. All are welcome to join the full day or specific agenda items. WEALTH day is made possible by our event hosts and sponsors. Sponsors have the option to exhibit at a booth during the Solutions Showcase, and/or make a financial contribution to help cover the Local Foods Luncheon and the Cookies & Conservation Conversation. Join WEALTH Day as an event sponsor today! WEALTH Day is a collaborative effort hosted by the WEATLH Partners, including: Climate + Energy Project, Kansas Rural Center, Kansas Interfaith Action, Kansas Natural Resources Council, Kansas City Chapter NAACP, Grassland Heritage Foundation, Metropolitan Energy Center, and Friends of the Kaw. Because we are all Kansans, we unite.